Hitting the mid-point in his seminal series of paintings, Tim Biskup's The Jackson 500, Volume Three, arrives just in time to bring another cool, colorful break to your summer dog days! Spend another year getting lost in Biskup's stunning, energetic world, and enjoy the middle volume of Biskup's five-year creative experiment. With an introduction by Mark Ryden, this year's offering contains paintings 201 to 300, all reproduced here at actual size. Each beautiful piece fuses Tim's punk rock sensibilities with his love for mid-century graphic design. 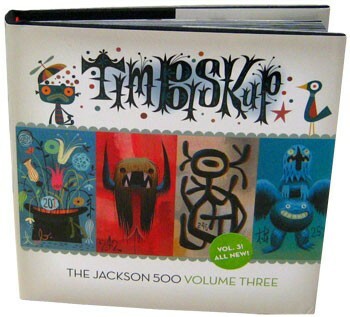 Timeless tomes for any fine-art fan, each volume of The Jackson 500 will be pored over again and again for artistic inspiration, especially if you're a fan of Paul Klee, hyperactive monsters, Ward Kimbal, color theory, Hieronymus Bosch, tortured beings, and suicidal herines. From international galleries to your bookshelf, these inviting little works are endless wells of creativity and energy.